Fitness is an essential part of maintaining your health. From childhood through the golden years, exercise should be a part of your daily routine. However, it’s not about running marathons or pumping iron in the gym. The key to lifelong exercise is to find physical activities that you truly enjoy and have a low risk of injuries that can throw you off track. Here are 9 of the major benefits of adding swimming to your exercise plan. Low Impact Exercise – Swimming is a great aerobic exercise option for those who don’t want to put additional pressure on their skeletal system. Being submerged in water will lower the effect of your body mass. This means that those suffering from stiff joints or arthritis can strengthen their muscles without impacting their joints. Increased Resistance – When compared to other exercises, swimming is ideal for improving muscle tone and strength. Each time the athlete kicks or strokes, they push against the water resistance. Flexibility – Instead of isolating muscles, like athletes do with certain machines at the gym, swimming is a full body workout. You are required to stroke through a full range of motion in order to stay afloat. This will increase joint and ligament flexibility. Calorie Burn – For every ten minutes of intense swimming, you could burn up to 150 calories. That is one way to work up a sweat while staying cool! Heart Benefits – The aerobic aspect of swimming can improve blood flow and strengthen your heart. It is also a healthy way to lower blood pressure. Stress Relief – Many swimmers consider the pool a place to release the stress of the day. Swimming increases oxygen flow and regulates breathing, much like meditation. Beat the Heat – Even in the hottest California temperatures, swimming is a great way to stay cool while exercising. Improved Sleep – Studies show that those who participate in dynamic exercises, like swimming, have less difficulty falling asleep and experience less sleep related problems, like insomnia. Social Aspects – Regardless of your age, swimming is a great way to meet new people. Participating in exercise classes, swim lessons, and water play are great ways to interact with other swimmers. Even if you aren’t the one in the lessons, many parents have been known to develop new friendships while sitting poolside. Premier Aquatics Services offers more than just swim lessons for children. We understand that a healthy lifestyle is a family affair, and we have classes and swim opportunities for family members of all ages and abilities. Between group lessons, private lessons, the Masters Swim Team, Aqua Zumba, and Frogman Fitness, it’s time to get back in the pool and have fun with your workout once again. Don’t let the end of the summer mark the end of your fun in the water. Enroll in swim classes today! Water emergencies can happen at anytime. Even experienced swimmers are at risk in and around water, and those who are not strong swimmers are at an even greater risk. The keys to minimizing the chances of these emergencies are to remain alert at all times and to be able to recognize the situation before it is too late. There are three stages of a water emergency: distressed swimmer, active drowning victim, and passive drowning victim. Distressed swimmers are not drowning, but they are in trouble. There are many reasons a swimmer can require assistance, including exhaustion, sudden injury or illness, and changes in the water conditions. A distressed swimmer is struggling in the water. While his or her head is above water and he is breathing, he is likely struggling to hold onto anything that is floating around him or he is visibly searching for help. He may or may not call for help or wave his arms, and he will be making little or no forward progress in the water. Distressed swimmers who don’t receive help often become drowning victims. Active drowning victims are struggling to breathe and stay above water. Because of this, he or she will exhibit the universal drowning response. It’s important to understand that drowning does not happen like it appears in the movies; it’s essential to be familiar with the reality: drowning happens quietly. An active drowning victim is struggling to keep his or her mouth above water and will not be able to call out for help. She will be working to keep her body vertical with her head tilted upwards, but children may tip forward into a facedown horizontal position. Her arms will be at her sides or in front of her, pressing downward in an attempt to keep herself afloat. Her head will be at the surface of the water or dipping below the surface. Passive drowning victims are not struggling. Whether due to sudden illness or injury or as a result of drug or alcohol use, some drowning victims slip underwater without visible warning. A passive drowning victim’s face or head will be submerged in the water, and he or she will not be breathing. He may be floating facedown at the surface of the water or fully submerged. If he is fully submerged and sinking to the bottom, he may simply look like a shadow. In the event of an emergency, you must first assess the situation. If you decide the person needs help, immediately alert the lifeguard to the emergency, if one is present. 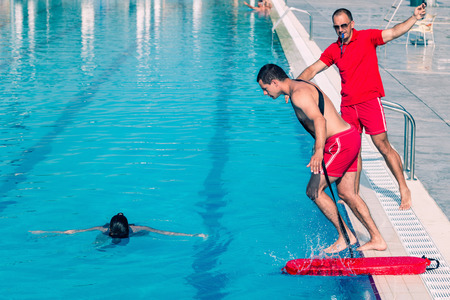 If a lifeguard is not present, decide whether you can safely provide assistance. Do not enter the water if the conditions are above your skill level, and always call 9-1-1 for help in the event of an emergency. Through first aid training, water safety classes, and swim lesson programs, Premier Aquatic Services is dedicated to providing our local community with the skills they need to be safer in and around the water. To learn more about our health and safety classes, please visit our website. Enrollment in our fall swim programs has begun. Click here to explore our fall class schedule. The recreational activity of swimming dates back all the way to the Stone Age. It is no coincidence that swimming has been around so long since it offers a wide variety of health benefits that make it great not only for the body, but the mind as well. Swimming has the least impact on your skeletal system compared to any other aerobic exercise. When the human body is fully submerged in the water, you only carry around 10 percent of your own weight while the water handles the rest. Since your body is carrying only one tenth of the weight, swimming makes less of an impact on your body. This is why swimmers can swim incredible distances without any negative impact on their joints or muscles. The Arthritis Foundation recommends that people who have sore joints or muscles from arthritis workout in the pool. It has been proven to loosen stiff joints and decrease pain from osteoarthritis. Water-based exercise can help improve mood in both men and women. Swimming is categorized as a meditative exercise. The constant stretching and relaxing of muscles combined with deep rhythmic breathing has shown to evoke the same relaxation response of the body, as yoga and meditation. As a result, swimming has been shown to decrease anxiety and depression in those who swim two or more times per week. If you were looking for another excuse to give up running, we might have one for you. A recent study out of the University of South Carolina discovered that men who actively swam each week had a 50% lower death rate than runners or walkers. The study also concluded that women would receive the same health benefits. Another study from Northwestern University concluded that swimming could add up to ten years to your life. Death rates from heart disease were nearly 80 percent lower amongst swimmers from the same study. Swimming is for everyone at any age. If you are interested in recreational swimming or signing your child up for swim classes or swim team, visit our website to locate a pool near you!